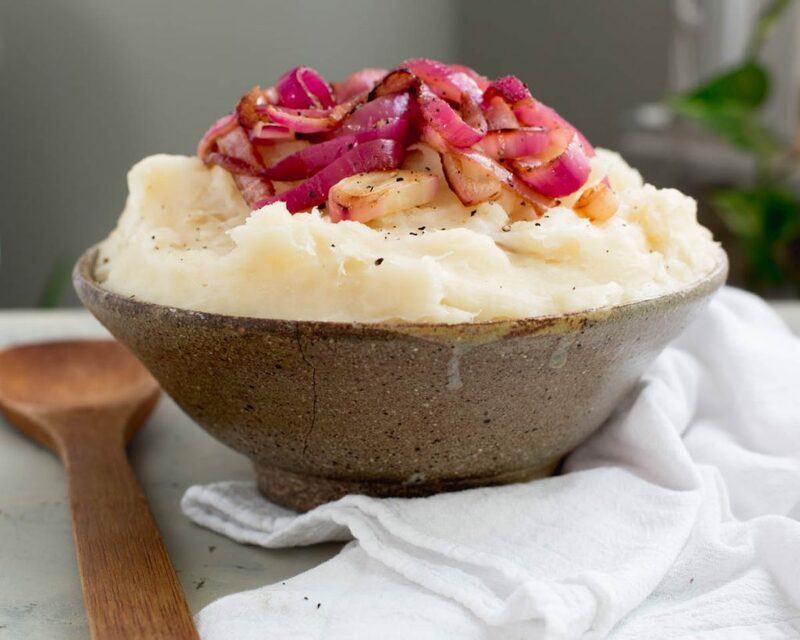 We’re kicking off Black History Month with a traditional Creamy Yuca Mash. All this month, we’ll be bringing you recipes inspired from the African diaspora. For those of you who don’t know, yuca is a staple in many African and Caribbean dishes. It’s made mashed, fried, in soups, and also stews. Growing up in a Dominican household, we would make yuca all the time…in fritters, soups, mashed, or boiled. 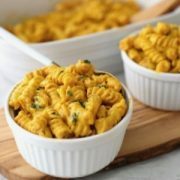 It’s one of my all time fave root vegetables so we thought it was the perfect all-star food to kick off Black History Month! Yuca is known as cassava, tapioca, or manioc. Tapioca is actually just the yuca root dehydrated and ground into a powder to give you tapioca. Yuca is a tuber vegetable (like potatoes, jicama, or yams) that survives best in hot, tropical climates. It has a delicious creamy texture that makes it perfect for mashing. If you’ve never had yuca, it’s probably most comparable to a potato in flavor and in texture, but a little more heartier and fibrous. It is a good source of vitamin C, manganese, and fiber. Many African dishes feature hearty vegetable stews and soups poured over grains or tuber vegetables. Yuca is often used as a base for these soups and stews. It is also often enjoyed as yuca fries (SO good!) 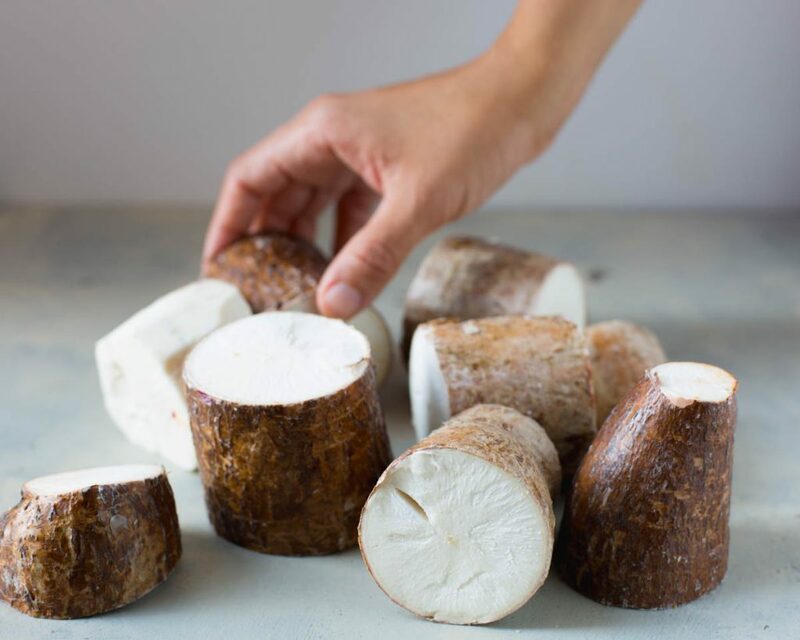 If you’re looking to mix up your carbohydrate options, then yuca is a must try! If you’re in New York, you can find it in most markets. Otherwise, your local Caribbean, African, or Central/South American markets should have them! Alright, enough talking- let’s get mashing! Cutting yuca can be a little tricky, and it took me a while to get my method down. I recommend getting a good knife, so that you’re not struggling to peel the skin off. Everyone has a different method of chopping up yuca, but here is a good video to get you started. Begin by bringing a large pot of water to a boil, and add the yuca chunks. Boil over high heat for 1 hour, 40 minutes, with the lid on (yes- that’s a really long time! It takes a while to soften it up enough for mashing). Check every 20 minutes, to make sure the water hasn’t dried out. If it has, add enough water to cover the yuca and continue boiling. At the end of cooking, the yuca should be super soft, and you should be able to easily put a fork through the chunks. Once done, add the yuca chunks to a bowl (don’t throw away the water yet!). Add 1/2 cup of the starchy water you cooked the yuca in, along with the butter and mayo to the same bowl, and get to mashing! You can use a pestle, potato masher, or whatever tool you like for mashing. It’ll take a few minutes, and a good arm workout to get the mash creamy. Mash in salt, to taste. 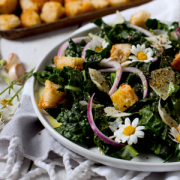 Enjoy as a side, topped with sautéed onions! In the Dominican Republic, we usually enjoy yuca with sautéed red onions. For our onion topping, we just sautéd red onions with olive oil and red wine vinegar on medium heat for a few minutes, until tender. This Creamy Yuca Mash is a great side dish for your favorite meals. 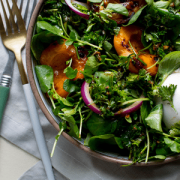 Just pair with a protein and veggies to balance out that plate. How many of you eat yuca as a staple like we do?! What are your favorite yuca recipes? Mash in salt, to taste and enjoy as a side, topped with sautéed red onions!